At Taste the Cracklin in Onchan, we want to give you the very best food and this is why all of our food is sourced locally, we use only the best fresh produce to ensure that your hog roast tastes spectacular. You deserve the very best catering for your event and we ensure that our hog roast will beat all of your expectations for a hog roast; Onchan has seen many of our specialist hog roasts catered events over the past few years. As our reputation grows, we continue to get busier and busier which is great because we love nothing more than spreading our way of cooking to more and more people. All of our chefs are happy to answer any questions that you may have and they will also answer any questions your guests may have, seeing a hog roast being cooked is not an everyday occurrence and so questions occur. We also give customers an opportunity to rent one of our machines, so they can cook for their own guests. It may look difficult to operate our machines, but believe us. We’ve spent many years improving our machines to make them as customer friendly as possible. 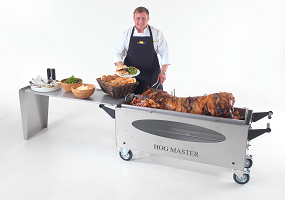 A hog roast is great to see being cooked and our machines allow for the cooking to be seen, in front of your guests, watching the pig rotating and being cooked within. Alternatively, we can also cook away from view of your guests if this is what you would prefer we do. The choice really is yours. A hog roast is the perfect catering for any event with the ability for it be cooked both indoors and outdoors, so the weather will never be able to ruin the day. When it comes to finding the perfect hog roast, Onchan is home to our specialist Take the Cracklin machines and chefs. If you’re ready to find out more and learn more about how we can help you. Now is the time to get in touch with us.